Nagaur Cattle Fair is Celebrated mostly Every Year's January month's last week or February Month's First Week in Nagaur Rajasthan. One of the largest cattle fair of India, the Nagaur Fair of Rajasthan is a major event in Rajasthan. 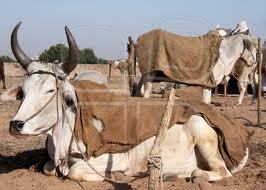 The Nagaur Cattle fair of Rajasthan is held once in a year between January and February. 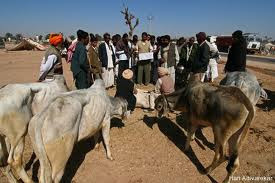 The small town of Nagaur comes alive with bustling activities and people who come here in massive numbers to take part in trading of livestock. The livestock includes not just cows but also, camels, goats and sheep. They are decorated beautifully by their owners who look absolutely dramatic dressed in their colorful attires. Read on to know more about Nagaur cattle fair of Rajasthan. The Nagaur Fair is held in charming Rajput town- Nagaur, located between Jodhpur and Bikaner. The Nagaur Fair is held in the month of January-February every year and continues for four days starting on Magh Shukla Saptmi. Every year about 70,000 bullocks, camels and horses are bought and sold in this fair. The Nagaur Fair is an attraction for tourists. It magnetise visitors from all over the world, who come to see the trading of camels, cattle and horses by their owners dressed in colourful and beautiful attire. The picturesque sight of people dressed in beautiful dresses and participating locals and tourists in sports is worth capturing with camera. Nagaur district is the land of fairs. 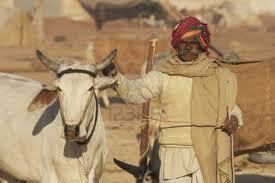 They are not only a hub to sale and buy cattles but also show the true spirit of living life. The rural people take on these fairs as big social events; thus participate in these fairs very eagerly with great enthusiasm. In addition to the cattle things that are of routine use even from needles to nails are available in these events. Fairs witness strong social harmony and are seen as the true expression of rustic ruralRajasthan. The significance of the Nagaur Cattle Fair lies in the fact that it is the second biggest cattle fair in Rajasthan. The fair displays as many as 70,000 bullocks, horses and camels. The huge number of cattle bought in this fair is to sell it to buyers. The popularity of this fair had increased a lot in the last few years. There are a number of factors which have enhanced the status of the fair. However, the main reason is the quality of cattle sold in the fair. Moreover, they also boast an attractive look as the cattle are very well decorated. The lavish décor with the help of wonderful accessories impart a great look to the cattle. To keep in tandem with the cattle, the owners also come to the Nagaur Cattle Fair well decked up. Their dress code mainly includes colorful turbans and long moustaches. 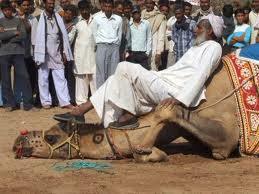 The Nagaur Cattle Fair also has a number of other attractions for the visitors. Besides being a trading place for cattle, the fair also sells a number of other items. The various other items available in the fair include iron-crafts, wooden items camel leather accessories and various other items. The fair also has a renowned Mirchi Bazaar or Red Chili Market. Nagaur Cattle Fair also comprises of sports events to make it more attractive to the tourists. Sports events like bullock races, tug-of-war, cockfights, camel races are a great attraction for the tourists. There are also a number of other forms of entertainment in the fair. Jugglers, storytellers, campfire and puppeteers add to the entertainment value of fair even more. 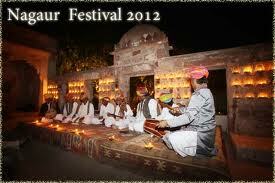 You will also enjoy listening to the folk music of Jodhpur played in the fair. A visit to the fair will be a memorable experience for sure. The cattle fair in Nagaur will be a unique experience as hardly anywhere else in the world you will see such large scale trading of cattle. The variety of entertainment options available in the fair makes your visit truly worthy. Hence, try to visit the Nagaur Cattle Fair as soon as possible. It is guaranteed to provide a great experience. 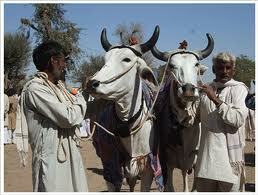 Indianholiday.com offers online information on Nagaur Cattle Fair, Nagaur and other Fairs and Festivals of Rajasthan.